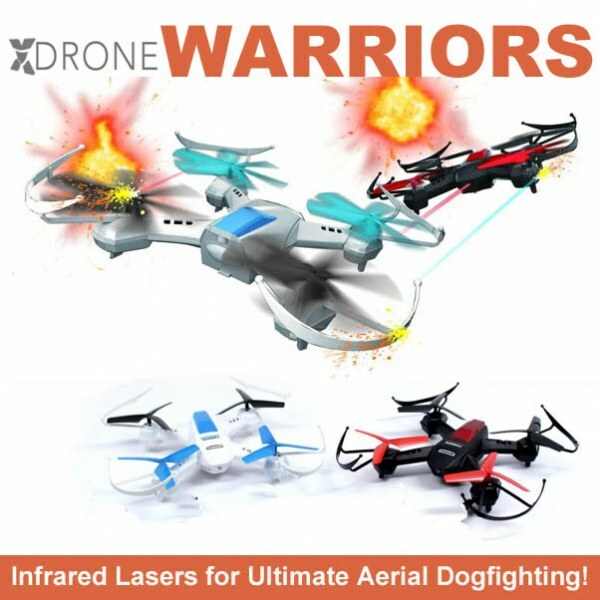 XDrone Warriors with infrared lasers for ultimate aerial dogfighting. Capable of flying indoors or outdoors at up to 16mph it&apos;s the perfect quadcopter for small quarters. Its protective cage system, multi-rotor technology and auto-stabilizing sensors allow the XDrone Warrior to safely and smoothly fly up/down, turn left/right, fly forward/backward and lean left/right. Oh, and did we mention that it can perform acrobatic flips? Oh yeah. Fly indoors, master flips, tricks and speeds of up to 16 mph.